WideBino28 is a peculiar star-gazing instrument yielding 28-degree field of view with your both eyes. While most constellations can be captured within a field, 1 or 2 magnitude darker stars can be detected. Since early 90's, this unique device has been enthusiastically greeted by huge number of Japanese astronomers. Now it's your turn to experience this marvelous view. 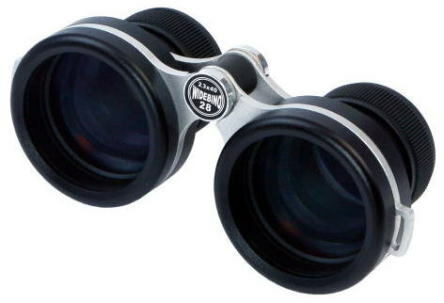 Basically the field of view of Galilean opera glasses is very small. The only way to widen it is to use extremely fast (f/2 or faster) objective lenses, but normal achromat doublet lenses of such fast f-ratio show strong aberrations and it's practically impossible to be used for visual observations. The optical design of WideBino28 is epoch-making as adopting 2-group 2-element meniscus objective lenses and 1-group 2-element cylindrical eyepieces, achieving edge-to-edge very flat widefield with very little aberrations. You can enjoy pinpoint star images within full field of view. Every surface of the lens element is broadband multi-coated to enhance the transmission rate, and all the inner walls are thoroughly threaded and blackened to eliminate the stray lights. Most parts of Max. 123mm width / 255g weight compact body are made of metal. Individual focusing. Front & rear dustcovers are standard. Comes with a neckstrap and a soft carrying case with a shoulder strap and a belt loop. The extremely wide 28-degree field of view brings overwhelming feeling of liberation, having a great aptitude for night sky observations. It can capture one constellation within a field of view, with 1 or 2 magnitude darker stars emerged - it must be the best and the only one device that can do a "feat" for the observes to see the whole figure of a constellation with scattered deep-sky objects in it. Especially, the beautiful images when seeing the Milky Way are beyond expression. Once you see it, you must become addicted. Please do have such a peculiar experience as "constellations come closer to you". While keeping the excellent optical design as it was, the polishing accuracy has been improved, and adding very high transmission broadband multi-coating on every optical surface - resulting higher sharpness and better image contrast than the former model's. The minimum interpupillary distance of the former model was 58mm - a little too wide for some users. It's now down to 52mm, covering almost all the people including young children. The diopter range to focus infinity was rather narrow in the former model - any shortsighted person whose eyes were below -4 diopter couldn't reach the infinity focus. Now it comes down further - anybody whose eyes are over -6 diopter can reach the infinity focus. Galilean telescope system has no eye-relief. The best way to see the widest field of view is to "press" your eyes close to the eye lenses. Therefore, it's essential to see through WideBino28 with your naked eyes. The distance between the eyecup end and the eyelense surface was 7mm in the former model, but it's now 5mm. You don't have to press your eyes so tightly to the eye-lenses to see the widest field of view. The new model is 3mm shorter in the width and 25-grams lighter than the former one. There were no strap holders in the former model and it was inconvenient to wear it during the observations. 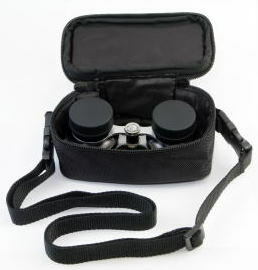 Now two strap holders are added on both sides, and a neckstrap comes as a standard accessory. A 255-gram lightweight unit can be pulled around your neck without any stress - you can use it anytime you want to see.The inside size of the strap holder is large enough as 10mm length / 3mm width - switchable to other fasionable straps for mobiles or compact cameras. *Text and illustrations provided by Kasai Trading Co. Ltd.